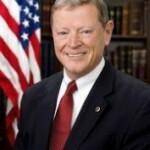 WASHINGTON, D.C. – U.S. Sen. Jim Inhofe (R-Okla.), a senior member of the Senate Armed Services Committee (SASC) and member of the Senate Foreign Relations Committee (SFRC), today reacted to President Obama’s meeting with potential war criminal and illegitimate leader of Cote d’Ivoire Alassane Ouattara in Washington, D.C.
Inhofe cited Amnesty International’s report from July 28 that states half a million Ivorians are displaced in post-election violence, and are prevented from returning home because of a “climate of fear” that continues to reign in Cote d’Ivoire. Amnesty International specifically singles out Ouattara’s security forces and his state-sponsored militia composed of Dozos who continue to target pro-Gbagbo ethnic groups. Dozos, traditional hunters, are a mercenary group that both Amnesty International and the International Committee of the Red Cross blame for carrying out a massacre in April of at least 220 people in the western town of Duekoue. Beginning late last year, Ouattara fraudulently won Cote d’Ivoire’s presidential election, and after President Gbagbo revealed the fraud, led a rebel army that violently overthrew the Gbagbo government with support from the French military, which wrongly intervened in this former French colony. Inhofe has regularly called for new elections in Cote d’Ivoire. In May, Inhofe demanded answers from Administration officials during a SFRC hearing on the current crisis in the war-torn country. He has remained an outspoken critic of Ouattara and has repeatedly drawn attention to this issue on the Senate floor.